Apple’s 12-inch MacBook with Retina display is a fantastic mobile computer for the right kind of owner, but it does have limitations. Its compactness is a plus for those on the go but becomes a liability for users in a home or office where more screen real estate will increase productivity (see “The 12-inch MacBook: A Different Mac for a Particular User,” 29 April 2015). In particular, the MacBook’s single USB-C port can be annoying for those wanting to attach peripherals while still being able to charge the laptop (see “MacBook Accessories Reduce Single USB-C Port Inconvenience,” 10 March 2016). Both of these problems can be addressed in one fell swoop, if not perfectly, with a new product that is tailor-made for the MacBook. Acer’s H277HU display is a 2560-by-1440–pixel (or WQHD) beauty with a 27-inch IPS panel, a 16:9 aspect ratio, a thin gold bezel, and a gold brushed-metal stand in the stylish shape of a ring. 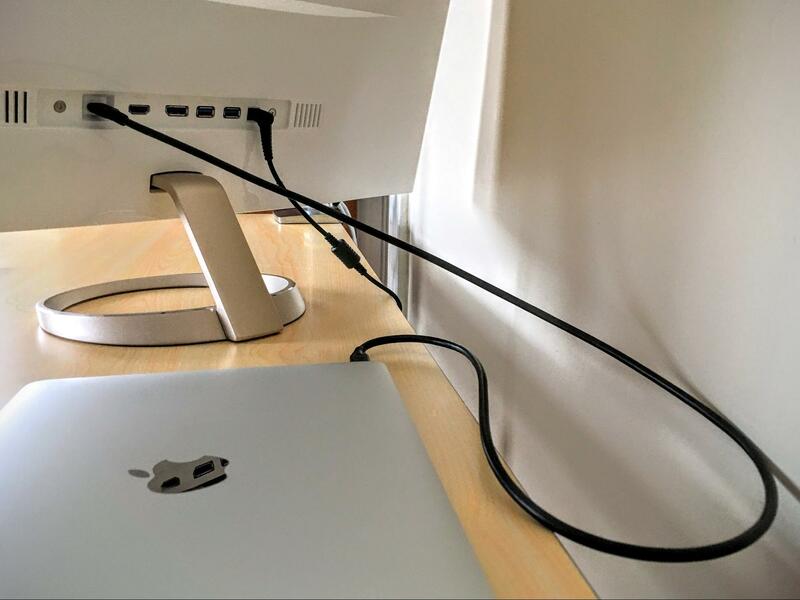 Key for MacBook owners is the H277HU’s USB-C port, meaning that you can plug the laptop into the monitor directly in a pleasingly minimalist fashion, instead of via clunky adapters. Once connected, the MacBook gets power via the display’s AC adapter. The screen also acts as a USB hub, providing a couple of USB 3.0 ports with USB-A connectors on the back. Most important, MacBook users score a gloriously ample working area that can be used as an extension of the laptop’s screen. It can also mirror the MacBook’s screen, but the two are such different sizes that it’s not a big win. I prefer the third option: shutting the MacBook and using just the display, which offers more than enough space for side-by-side working windows or the use of interface-heavy apps like Final Cut Pro. 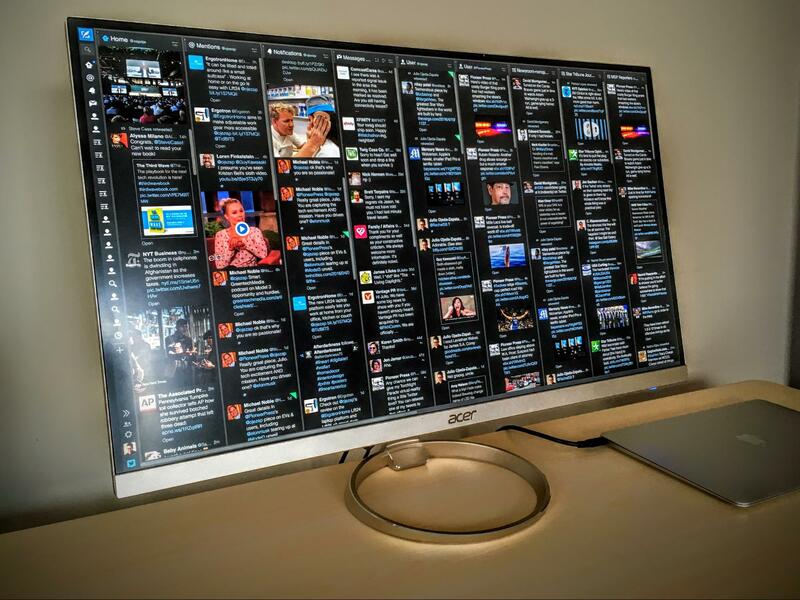 TweetDeck, a multi-column Twitter client that works best on larger screens, is great on this display, with room for up to nine columns. 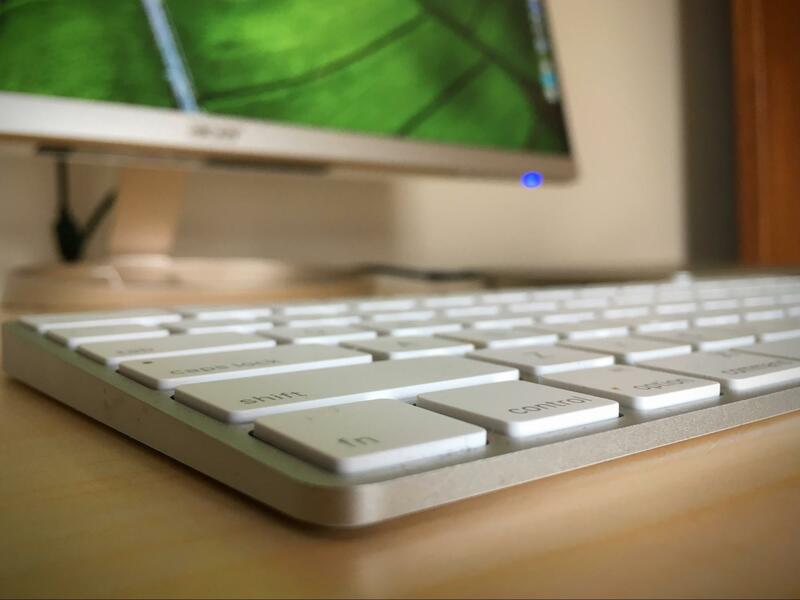 Apple’s Magic Keyboard and Magic Mouse 2 complete my setup (see “Apple’s New Magic Peripherals Offer Modest Change,” 25 November 2015). 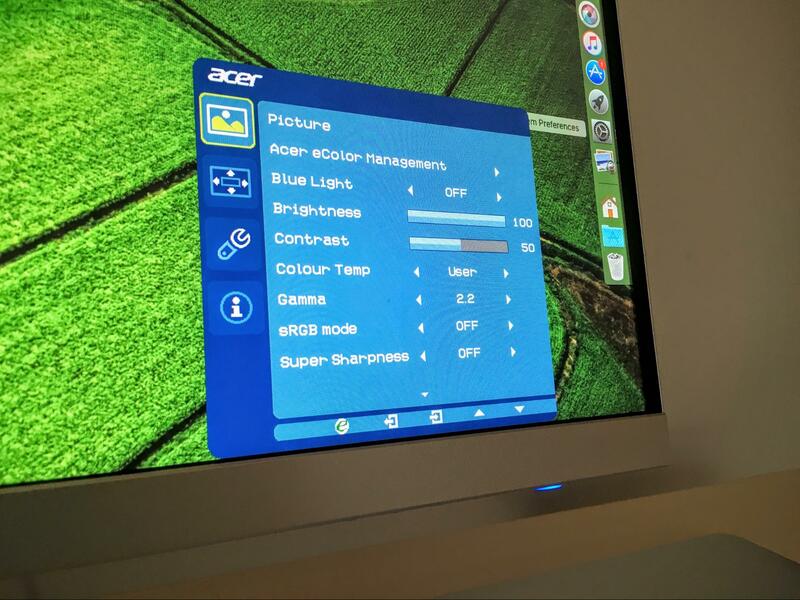 To be clear, the Acer H277HU is not a Retina display. 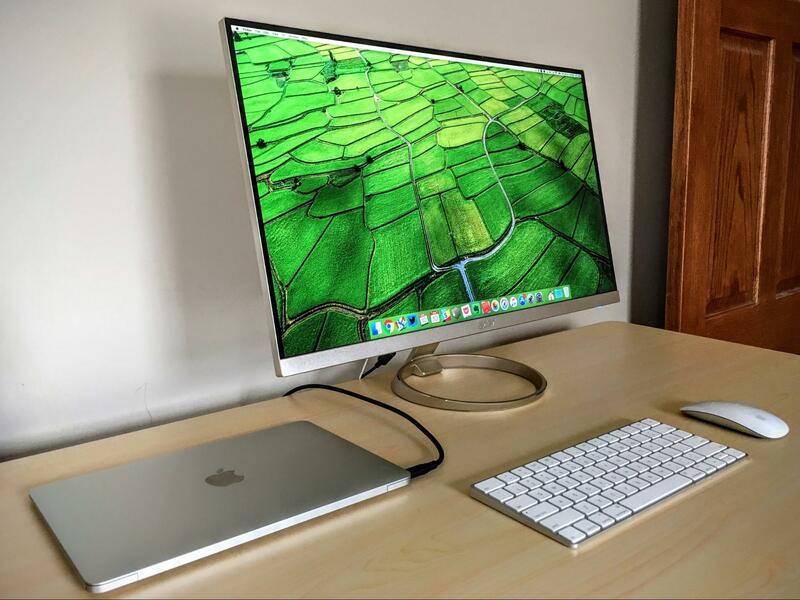 By comparison, Apple’s 27-inch Retina iMacs boast an astonishing resolution of 5120 by 2880 pixels, exactly four times the H277HU’s 2560-by-1440 resolution. Even the 21.5-inch Retina iMacs offer a resolution of 4096 by 2304 pixels. However, Acer’s display beats non-Retina 21.5-inch iMacs that provide only 1920-by-1080–pixel resolution, and it’s a little better than the MacBook’s own 2304-by-1440 resolution. The H277HU’s sub-Retina design could be a deal-breaker for some. Indeed, after heavy use of Retina-grade Macs and iOS devices, my eyes rebelled a bit with this monitor, but I got used to it quickly. The $499.99 price is right, too. This means, for those who have already invested in a premium-priced MacBook, that an external display can be added to the mix at a reasonable cost. The H277HU’s image quality won’t win any awards. The screen isn’t super bright and lacks vibrancy. Colors seem accurate apart from whites that are subtly tan. Not being a graphics guy, I didn’t mind this and have happily used the display as my main work screen for weeks with no eyestrain or other issues. It offers a suite of fairly sophisticated color controls for those with high sensitivity. But some of these — like “blue light,” “warmth,” and “super sharpness” — just seemed to make things worse. Overall, Acer’s display largely works as advertised. Connecting it to the MacBook via the sole USB-C port in the back was plug-and-play — most of the time. A couple of times, the MacBook desktop wouldn’t come up on the large screen until I futzed a bit. The USB-C cord bundled with the display seemed to work best, even though any USB-C cable should be fine in theory. For those listening to music, the H277HU has built-in speakers, but they aren’t very powerful and can’t be controlled using the Mac’s on-screen audio controls or with the Magic Keyboard’s audio buttons. The speakers are on the back, which is necessary for achieving those razor-thin bezels, but that makes the sound muddier than with front-facing speakers. There is no audio jack for connecting external speakers. I stuck with the MacBook’s internal speakers most of the time. Bluetooth speakers are another option, or you can plug speakers into the laptop’s own audio port. In terms of ergonomic options, the monitor can tilt forward or backward up to 15 degrees, but it can neither swivel nor be raised or lowered. It’s quite stable on its base, swaying a bit only if jostled. Don’t assume this display is only for USB-C users. It also provides full-sized DisplayPort and HDMI ports on the back, and I had no troubles connecting a 13-inch MacBook Pro via HDMI. But, after using it, I’m not scanning the horizon for better prospects. Although the display isn’t perfect, it’s capable and affordable, and would be a terrific sidekick for any MacBook owner seeking an external screen. Several times I've been in a situation where I'm presenting at a client office, and need arises to connect to the Internet, and only a cord is available, not Wi-Fi. Each time it's bewilderment that my MacBook Air is unable to connect to a projector and hard-wire Internet at the same time. The monitor sounds nice, but I'm really tired of having to make accommodations for Apple's blatant failings. The MBA is pretty but stripped, iTunes does a horrible job syncing music between my desktop Mac and my iPhone, I need to have an ancient iMac sitting on my desk (in addition to a current desktop Mac) to access the hundreds (maybe thousands) of my older docs that can't be opened on more recent Macs, notes on contacts duplicate like rabbits, syncing on Calendar is unnecessarily complex and error-prone, and so on. One of the earliest Apple slogans, back in the Apple ][ days, was "Simplicity is the ultimate sophistication". No one says that now. That's why I bought an Apple USB Ethernet adapter while they still made them. I cannot understand why they never updated it to a USB3 model with Gigabit support. As long as not every system comes with two TB ports, having a USB solution for networking seems necessary. Looks like a well thought out peripheral. Plus only one cable needed to "dock" the Macbook and no need for an expensive Apple adapter! The resolution could be an issue for intensive use. Thanks for pointing out that link in the article. Both web pages (the one in the article and the one I cited above) show the same part number, but have contradictory information about the tilt. The web page mentioned in the article does say the tilt is from -5 to +15 degrees. I got to the page I cited by going through the shopping portal for a rewards program, but you can get to the same page by clicking Store and entering the part number. Because the tilt is important to me, I called the Acer store (at 855.517.4298) and the nice, heavily accented man told me that the monitor does tilt even though the store page says it does not. He did seem taken aback when I said I looked forward to seeing the corrected specs on the store web page. In looking into the details of the 27"and 25” display info, Acer boasts with the Blue light filtering for eye safety as a big plus (I want this feature). Has any one found out that will work with any of the Macintosh Hardware/OSs, primarily the well talked about ability to dim the display? I am also looking at these products for my MacPro-2010 that has a newer AMD Radeon HD 7950 3072 MB Card with two Mini-display and a HDMI port. The reason is my two older 23" Apple Cinema HD Displays have failed one by one. Now down to one last good one, that I bought used. No apple support for old reliable products!! (obsoleteness is job one at Apple). Just and FYI! I use Bootcamp to dual boot into Windows 10 for consulting work. So I figure as time goes on I still use this computer till 2026.